The 906ts does not have coverage for SuperCars, the 908s does. 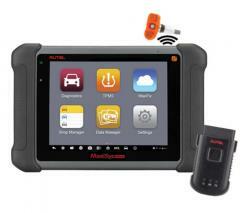 The MaxiSys 906TS and BT share the same diagnostic software as the MaxiSys Elite. They will have the same bi-directional controls, PIDs, and should perform the same coding functions. The Elite will come with a J2534 passthru interface and has the ability to perform module reprogramming for BMWs on the tool, without the need for a subscription. The 906 cannot use the J2534 interface. The 906TS has the built-in TPMS antenna for TPMS sensor programming and activation, which the Elite does not have.